QuikClot® stops bleeding 3 times faster than blood on its own. Mesh bag keeps QuikClot® Zeolite mineral beads out of wounds. QuikClot's® low heat formula won’t harm skin. 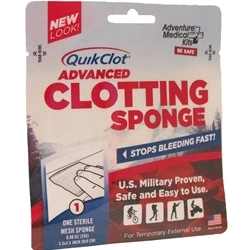 Item Name: QuikClot Advanced Clotting Sponge 25g.